The TRA is organising all sorts of classes and activities in the Ainsworth Tenants Hall. It’s a beautiful space with windows all around and looking down over the green. We have got it cleaned up and are about to have it re-decorated. On this page we have a few of the classes that have recently started and will be putting on a full timetable shortly. Please note: The main resident running this is having to stop until late November so there will be no film club until then. Hitchcock, Orson Wells, musicals, westerns!! 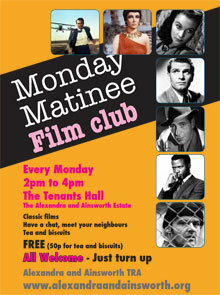 Come along and see some classic films and meet your neighhbours, have a chat. This is primarily for older residents but anyone is welcome. Just go along any week you are free and fancy watching a film on the excellent new huge flat screen TV and audio system. Feel free to bring along some popcorn to share! The fantastic team at Families in Focus are going to be running a brilliant after school club in the Tenants Hall and it’s all free. There will be a focus on fun and creative activities including designing a comic strip, poster design and also a trip to see a film. This if for children of primary school age only. Call Elaine on 020 7974 1957 to find out more. This class appropriate for all ages and abilities. Come down and give it a try! This friendly Iyengar yoga class is open to both beginners and experienced yoga practitioners and is suitable to all ages. It will improve your strength, flexibility and balance and reduce stress. Yoga mats and equipment are provided so just turn up in loose clothes. The class is taught by an experienced and certified yoga teacher who lives on the estate! First class free then only £3 per class. Taught by a highly experienced teacher. Come along and give it a try. Anyone is welcome to join the class. Residents’ run food co-op shop. Come shop for your fruit and veg right on your doorstep. Come find out what is going on, have a cup of tea, meet your neighbours. There is also a free book swap and there are usually kids around playing, drawing. Just turn up and join the fun. There is up to date info on the homepage. WE now have a new website built and maintained by members. This has more info on the coop plus will have recipes, details on how to order and much more. Please come visit us now at http://shefcoop.wordpress.com. - Gentle Exercise for older residents? SHAK run courses for local people at their two SHELL centres on Ainsworth Way and use the hall for a creche to allow parents/guardian to attend. These courses are free for people on benefits. It's a wonderful centre and the staff really friendly. Pop in and see them, and for more detailed info on courses go to their website http://www.shakonline.co.uk/shell/shell-courses/. If you'd like to find out how to use a digital camera come along to these fun and informative sessions. Or if you'd like to find out how to make and edit your own movie the SHELL Centre has another course for you. Courses are free and start now and are suitable for all ages! To find out more call 020 7372 7021 or visit the SHELL website. page for more info on what is currently going on. SHAK also runs the ARC which puts on activities throughout term time and in school holidays specially for young people aged 9-19. Run by qualified and experienced youth workers, the Centre is a safe and welcoming space for young people and everyone is encouraged to get involved and meet other young people whether they are new to the Centre or have been coming for years. They are open four evenings a week during term time and for longer periods over the school holidays. The ARC has just invested in state of the art music recording equipment.